Are your donut cravings getting out of hand? Lucky for you, no matter where you go, you’re always close to at least one brand of franchise donuts! Whether they’re the raised variety or cake variety, fresh and hot donuts often start the work day off right for millions of us. Here are 10 details about doughnuts I bet you didn’t know. How much do you know about the history of doughnuts? 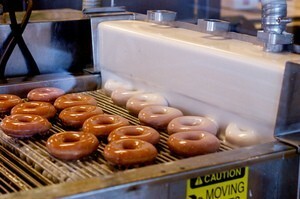 Krispy Kreme has been around since 1937 when they opened their first store in North Carolina. Their original yeast-raised glazed donuts simply melt in your mouth, if you’re fortunate enough to get them hot off the line! Dunkin’ Donuts started in 1950 in Massachusetts. They have nearly 9,000 stores located around the world, with the majority of them located in the U.S.
LeMar’s Donuts is another old-time favorite that opened in 1960 in Kansas City. With roots in the donut business going back to 1933, they now have 30 stores in 6 states. Daylight Donuts is based in Oklahoma with retail outlets numbering over 900. Donut Connection has outlets spread throughout the eastern half of the U.S. They serve 35 different varieties of fresh warm donuts every morning. There is one other option, if you’re looking for fresh & hot franchise donuts. The local carnival is sure to have at least one mini-donut concession. That’s the first place my wife goes during the summer season. You could even open your own mini-donut concession business, and have an endless supply of Lil Orbits donuts whenever you want. What could be better than your own fresh hot donut machine? It almost makes me want to go open a franchise donuts business for myself!